Thanks to shows like Game of Thrones and films like the Hobbit trilogy, medieval fantasy has seen a significant rise in popularity over the last few years. Some students here on campus, however, have been ahead of the trend, and making themselves noticed in the process. Texas A&M University-Commerce Chapter of Dagorhir, known as Oakvale, is ran by student John Bowen, who administrates his active 30-man chapter. Dagorhir, commonly known as larping ( short for live action role playing), is a battle game spread throughout the nations that involves members in a full contact swing of weapons; plastic that is. Not only do larpers, as they are known, partake in battling action, but they also build their own weapons to meet safety regulations. It is commonly seen as a form of martial arts due to the skill based combat. Dagorhir was founded in 1977 by college students with a shared interest in Tolkien’s Lord of the Rings and medieval history. The memberships of this sport expanded rapidly, and by 1986 the first national event, called Ragnarok, was held. “The game is an acquired taste, but it is a great way to make some friends and do some serious cardio work,” Bowen said. Aside from these benefits, Dagorhir can also be seen as a positive outlet for aggression and frustration. As far as Commerce larping is concerned, it is a serious sport practiced three times a week: Wednesdays and Fridays at five, and Sunday at two. Practices generally last from four to five hours, with the various agendas of either practicing to get better, practicing to have fun, or practicing to compete on a national level. Each practice has different members show up due to the significant amount of members they have involved. The number of members prevents everyone from having a time they can all meet. Practices are led by seasoned fighters who train and recruit. So how does one go about battling and winning? Well first, they must sign a waiver, clearing them to play. Then the battling begins. When it comes to battling, Bowen explains there is a hit minimum, meaning you have to “hit one another with a set calibration.” If you or your opponent is struck on one of your limbs, you lose this limb during battle; the loss of two limbs is a loss of battle. However, in a literal battle in a leotard, or one piece bathing suit, if you are struck anywhere the clothing covers it is an automatic loss. 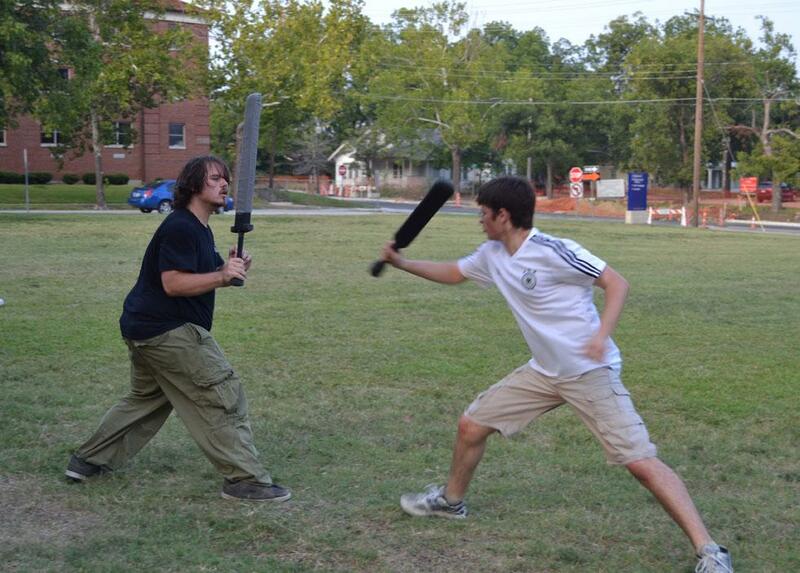 Larping is growing extremely fast throughout the country and becoming one of the top role-playing games. “The group is open to all new participants, whether those participants wish to partake in friendly combat or just make new friends,” Bowen said.